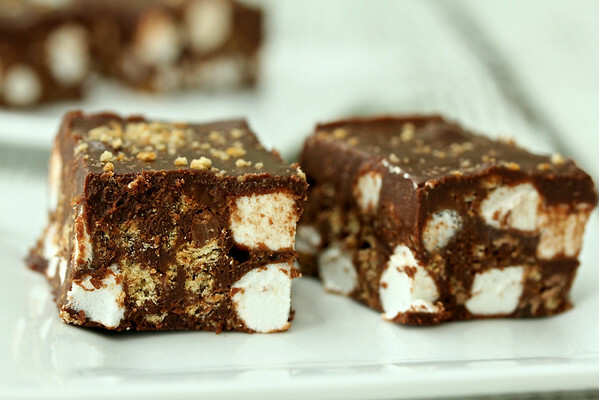 These Indoor S'mores Bars are ridiculously decadent. They are also super easy to make. The second best part? They don't require baking. These bars are comprised of an amazing mixture of chopped graham crackers, marshmallows, milk and bittersweet chocolate, and espresso powder, topped with a chocolate glaze and graham cracker crumbs. Melt some chocolate, chop up some graham crackers, throw in some marshmallows and chopped chocolate, glaze the entire concoction with more chocolate and then dust it with some graham cracker crumbs. Heavenly. Line an 8 inch square cake pan with foil and spray it with spray oil. Mix the chocolate chips and set aside 1/2 C.
Place the rest of the chocolate chips into a large bowl. Sprinkle the espresso powder over the chips. Pour the boiling water over the chips and let the mixture sit for a few minutes. Stir until the chocolate has melted, and then add the butter and continue to stir until smooth. Set aside 3/4 C of the chocolate mixture for the glaze. Mix the graham crackers into the remaining chocolate mixture, and then add the marshmallows. As the mixture cools, chop the remaining 1/2 C of chocolate chips into 1/4 inch pieces, and fold into the chocolate, graham cracker, and marshmallow mixture. Pour the mixture into the foil lined cake pan and spread evenly. Evenly pour the chocolate glaze over the mixture. Let the mixture cool. Sprinkle with graham cracker crumbs. These bars are best kept in the refrigerator until just a few minutes before serving. This recipe has been adapted from Simply Sensational Cookies by Nancy Baggett. The book is pretty sensational. Oh yum! I'd rather have these than regular s'mores. Oh my goodness... I smell an addiction coming on, Karen. LOVE! Thanks Becca. I have to keep them in the garage fridge so I'll not get too tempted. I love the addition of the bitter espresso powder, Karen. I loved s'mores as a child but often find them too sweet nowadays. The espresso would balance that nicely for me! That and the dark chocolate. Thanks Stacy! Nothing better than a smores and I love your version even more!! 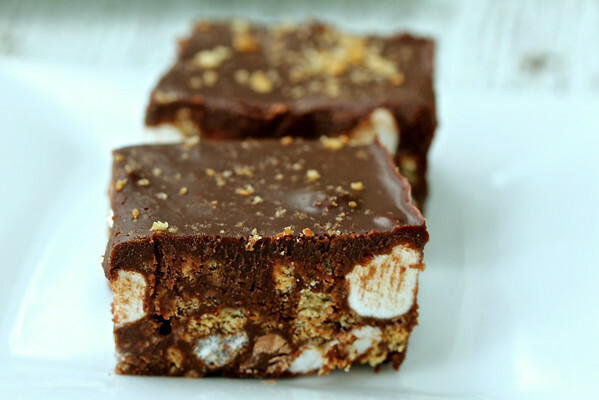 I love S'mores and these are a great way to make them without turning on any heat source! Or poking someone's eye out, right? Oh these look fantastic! Love the idea of smores without the kids having to stand in front of a fire waiting for the marshmallow to melt. I really like the sound of your cookies, chocolate and coffee yum. You can't really taste the coffee, but it totally enhances the chocolate. Hi Karen, oh these look wonderful, my family would love these. Pinned! They are one of my favorite recipes lately. It's hard not to visit them and shave off sliver after sliver. that looks so dangerously delicious! Yum! Yay! Indoor s'mores! These look very decadent and right up my families alley! Woohoo! So easy for kids to make. Wow, these look irresistible. I think I'll get my kids to make a batch. Such a great take on the campfire version. 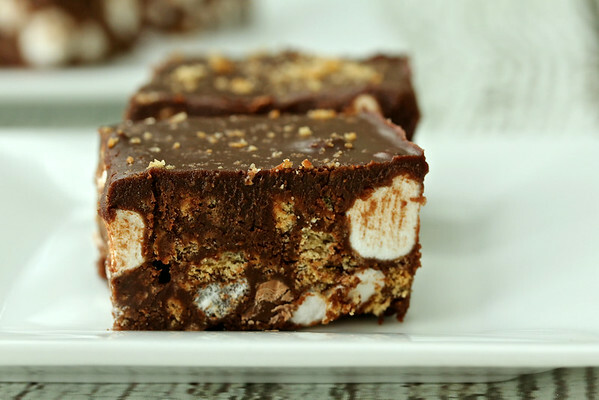 S'mores are one of my favorite summer treat and love your twist on the classic recipe. Now we can enjoy s'mores year round, no campfire needed. Thanks for having the party! !